The past two days of blue skies and hard cold winds have resulted in a general drying of the ground in the Somme battle areas, again permitting activities. British troops have already taken advantage of the improvements. Advancing on a line of 5,000 yards on the Somme, British troops have pushed their line forward from 300 to 500 yards. The battles on Monday and Tuesday were of the greatest violence. In order to break through at any price the British and French continued attacks in which strong forces were employed. In spite of their use of masses of troops, they suffered a heavy defeat. It is reported from the front that rows of dead are laying one upon another. But, all military eyes are on the deteriorating situation in Romania, where striking hard against the Russian and Romanian line, Field Marshal von Mackensen has renewed successfully his offensive in Romania. Attacking along a 40-mile front, the forces of the Central Powers have made good progress almost everywhere. On Monday, the Romanian fortress of Constanza was taken by the Germans. Constanza was one of the principal objectives of Field Marshal von Mackensen in his campaign. It is a particular importance by reason of the fact that it is the eastern termination of the only railroad between the Black Sea and the Danube. It has been a seaport and railway entrance for Russian troops and ammunition sent to the aid of the Romanians, especially in munitions, of which the Romanians have been reported badly in need. The loss of Constanza is bound to have far-reaching consequences for Romania in carrying on her military operations. 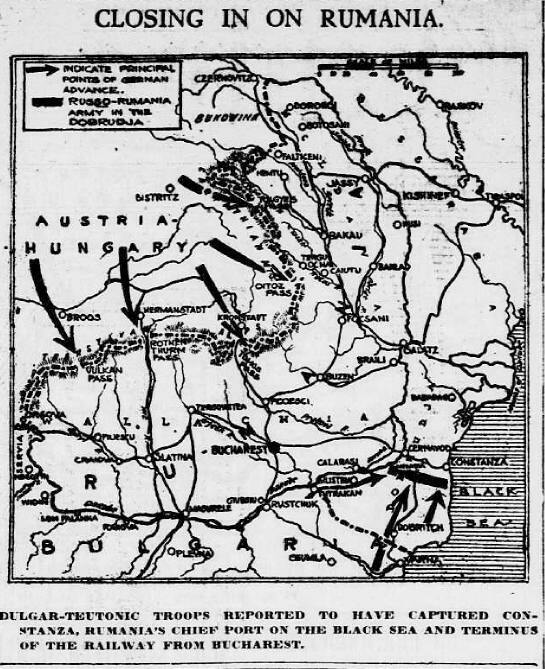 The German drive into Romania from the south has pushed the Russian and Romanian armies apparently to the last possible line of resistance in interior Romania. 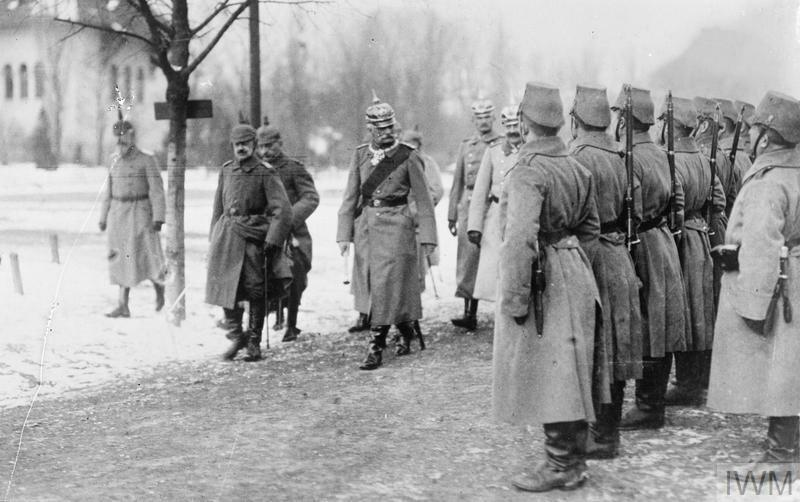 On the north, pressure is also being applied by the Central Powers. As a result Romania is being crushed between the two jaws of the Teutonic military machine. Field Marshal Von Mackensen’s new campaign was begun only last week, when an offensive along the entire line from the Black Sea to the Danube was open. The earlier efforts of the Field Marshal were started soon after Romania’s entrance into the war. It was notably successful in that it shut down the Danube with the capture of the fortresses of Turtukai and Silletria, but soon after it came to a halt. The opposing armies stood deadlocked for several weeks; while the Teutonic offensive in Transylvania was opened and the Romanians were driven back to their northern frontier passes. The pressure from the south was then renewed and apparently, without a check by the Romanians, Field Marshal von Mackensen’s armies have forced their way northward, advancing 20 miles a day, to within striking distance of the interior of Romania. One cannot escape the impression that on all the Romanian frontiers the defenders are greatly outnumbered, and all movements are in the wrong direction.